The 9000F is a fine machine which I purchased September 2010. 'It does everything it says on the tin' and the software is so easy to understand and use, I've never had a problem with it. The only niggle I have is that when scanning 35mm slides I cannot use the highest resolution that the scanner should be capable of. High quality scanning: 9600dpi resolution with high speed film support. 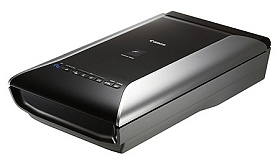 This top-of-the-range film, photo and document scanner is designed for film users also needing verstaile scanner productivity. Advanced features ensure exceptional quality at the highest speed.